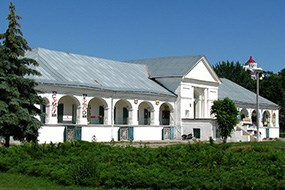 This building is one of the symbols of Bila Tserkva and is situated in the very heart the city. 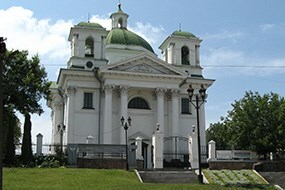 The church was built in 1812 in accordance with the classical traditions of Catholic architecture in the means of Xavier Branitsky. The interior of the church, its decorations, ornaments and frescoes were created by the best Italian masters. In the middle of the twentieth century, the church was closed for some time, but in 1964, after restoration work, the church was opened again to the public. Nowadays the Church of St. John the Baptist is the center of the chamber and organ music, and on weekends you can attend Catholic services. During the years 1833-1839, in the yard of the dilapidated church of St. Nicholas, the Cathedral of Transfiguration was built. The building was constructed in a classical style on the request of Countess Alexandra Branicka and has preserved a large number of historical relics: a collection of ancient manuscripts (XVII c.), Icons and paintings of the XV century and much more. 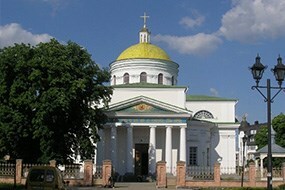 During the Soviet era, the city archive was stored in the cathedral and in 1956 the cathedral acquired the status of an architectural heritage of national significance, after which restoration work began. Today the cathedral presides over the ecclesial community. A former merchant's house, Bila Tserkva’s center, is located near the cathedral square. Trading rows were built in the XIX century, the largest trade fair in all of Kiev and the establishment of trade relations between the various communities of the province. Now trade rows are a unique example of a classic urban architecture, and one of the largest historical monuments of the city. This is a very picturesque place, rightfully considered to be the real "jewel" of Bila Tserkva and of the Ukraine as a whole. 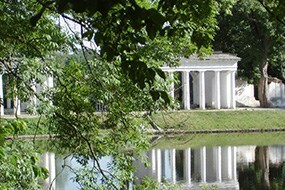 The park was laid down in the late XVIIІ century as a summer residence for the Branicki family. The designer of the general plan of the park was a French architect known as Myuffo, who designed the park in the traditions of English gardening style. In addition to the Branicki residence many other buildings were built in "Alexandria": Dance Pavilion, Rotunda pavilion, Chinese bridge, etc. In the center of the park lies the largest meadow in Europe, which is also famous thanks to its unique flora: 83 species of trees and more than 170 different species of herbs. Contemporary "Alexandria" has hardly changed since the Branicki county time, and is one of the most attractive tourist destinations of Bila Tserkva.